annual meeting upcoming June 1. School of Pinellas County said. than a mile east of U.S. 19.
miss an opportunity to hear her,"
source of support for Israel. election to the Federation board. Werner and Rabbi Ira Youdovin. Tickets are $7.50 per person. denoted who was being honored. Prisoners of Zion to be set free." day before his 11-year separation. free all the political prisoners. noon to 3 p.m. at the Center. the Kent JCC at 736-1494. Jewish Community Center in St.
slated from 1:30 to 4 p.m.
under will be admitted free. you with a $1,500 gift. Let Us Cater Your Next Affair!! We'll Teke The Worry Out Of It! at :Temple Beth-El in St.
the Jewish Institute of Religion. philosophy and theology at St.
should contact Dr. and Mrs. E.
the Dinner Dance, at 360-7800.
tions oneself: "What's it all about? have I contributed to this world? of Kashruth were being observed. true meaning of life itself. later in a career, in marriage, etc. or $66 Senior Citizens (55 I.
Tampa 83*4233 10 a.m. 10 p.m.
to grace tables of our fellow Jews. Pinellas Board of Rabbis, Ms.
had participated in a Seder. tJM* Your Travel Agent Knows! the local Jewish community, Gov. from children at the school. ed his or her own thoughts. ing these things," Igel said. pened in World War II." how the Nazis treated people." how many Jews were killed a day. they were not nice people at all." tell us, I think I learned to be more. the way we are here in America." terror of the Nazi regime. brotherhood of man can lead to. burden, but rather a liberation. Editor and Pubuaiiar Editori. PimUm County K.uriitivr du. Postmaster Sand address changes to The Jewish Floridian. paid Oui ot Town Upon Waojuaat. because you can learn a lot." we will be what you could not. your lesson to each generation. save us and the world. The words of the song by Mrs.
will such a thing happen, he said. as not a sound was made. Israel speaking as the survivors. the survivors' stories were Mrs.
Costa Rica "a real democracy"
porter of the Jewish State. after taking office four years ago. made recently in our country. to us: "This has to stop sometime. Don't impose feelings of guilt on . with a need to cast off a burden." if it knows what happened. 10:80 at the Golda Meir Center. loss to find the class worthwhile. May 20 to make arrangements.-. spend the day in St. Petersburg. and finish the day with a 1 p.m.
space for any of our excursions. "You can make the difference. year and hopes for the future." is an indication of its importance. Federation is in fact one of Mrs.
Barbara, a CPA in Miami. In addition to the county and St.
prove that life," he said. chance to be together as one." for the Memorial Day weekend, May 24-26 at the Sheraton-St.
the St. Petersburg area from the early 1920s through the 1950s. terested in attending, should contact Bunnie Katz at 345-0983. Pride of Pinellas, took first place honors in state competition. the Sweet Adeline's national competition. True stories that deserves repeating. ple she met if they had heard of an Eva Schecter. Still no luck. mother also had relatives there. "What was your mother's name?" Diane asked. "Eva Schecter," the neighbor replied. Sisterhood of Congregation B'nai Israel officers for 1986-88. Obolosky, who will also serve as membership vice president. there to start the necessary study. Mazel Tov to all. 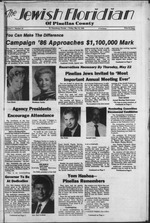 866-2007 or write me in care of the Jewish Floridian, 301 S.
tiveness of our advocacy actions. dress so your legislator can reply. community, you and your family. Union rate is very reasonable. ing vacated by Betty Hamilton. Dr. Stephen Greenberg, a St.
David Eric Gallace, son of Mr.
Amy Jacobson, daughter of Mr.
gregation B'nai Israel in St.
Torah and is active in Kadima. garden reception at their home. Tonya Jacobson, Mr. and Mrs.
Alan Kent of Kingston, N.Y.
Gregory H. Paull, son of Mrs.
also enjoys soccer and karate. 24 at the Kapok Tree restaurant. "**,. PhD. MM Brra. Dr*.. Ctarof. PL Ulli f*. Floridian deadline for May 30 edition. the Kotel honoring Israel's Independence Day. 8 p.m.
ing Israers Independence Day. 9 a.m.
District and Counties Council installation luncheon. 10 a.m.
Holiday Inn-Airport. $10 per person. B'nai B'rith Lodge 2603 meeting. Brunch. Guest Speaker: Dr.
Stuart Strikowsky on "Combatting anti-Semitism." 10:30 a.m.
home of Dr. Mandel and Karen Sher. Golda Meir Center, movie "Jerusalem, Jerusalem," 11 am. ecutive Board 4:30 p.m., Board of Governors 6:30 p.m.
North PineUas Chapter Hadaasah Regional meeting. cheon, Dolphin Beach Resort. Cost $7. B'nai Israel. 1685 S. Belcher Road, Clearwater. DeSoto Park, north end. 9 a.m. until ? Temple B'nai Israel, Clearwater, Friendship Club, 1 p.m.
tion and RSVP, call 736-1494.
quired. For more information, call Louis Goldstein 442-3462.
mation, call Bunnie Katz 345-0983.
non-members, $2.60 for children over 5. Reservations required. per couple. For more information, call Barbara Heller 360-7800. Westwind ORT general meeting and board meeting. Kent Center picnic, noon. Cost: Free to KJCC members; nor. members $7.50, adult, $3 children. Congregation Beth Shalom, Clearwater, Sisterhood meeting. Golda Meir Center trip to Jo-El's Kosher market. 12:30 p.m.
Woolf, 260 58th St. N., St Petersburg, 38710.
and anniversary party. 1 p.m.
Jewish National Fund Dinner. Tree of Life recipient: U.S.
Rep. C.W. "BUT Young. 6:30 p.m. Tradewinds Resort, St.
4-6 p.m. Special Guest: Gov. Bob Graham. Floridian deadline for June 13 edition. 1*7 ELBOW LANE MOUTH ST.
Center, 8167 Elbow Lane N.. St.
lunches are not readily available. PRE NEED CONSULTATION AND PREPAID, . tion in holidays and customs. the Metro Zoo and Planet Ocean. week of camp July 23-27.
ding area of Gainesville, Georgia. The Only All Jewish Chapel in Pinellas County /Ja2*-. at absolutely no cost or obligation to me. Fort DeSoto Park North End. your own food. All are invited. tact Jeff Donsky at 585-1888.
drinks, sports, games and fun. Brooker Creek Park at 10:30 a.m.
stall the Board of Directors. 1905 Hawaii Ave. NE, St.
the Don Ce Sar Hotel. Roslow, brother of the bride. private" dental practice in St.
will live in St. Petersburg. Resort, 4900 Gulf Blvd., St.
provided twice daily by the school. is oven toasted. Soeveryflake is crispy, golden and delicious.